But please add your own reasons! Please respond to the consultation, then sign my petition to Save Theale Library. IKEA have withdrawn their application to build a 42 metre-high “navigation tower”. Thank you for everyone who commented on this and heled persuade them that it would not be approved. Application 15/03427/ADV for a 3 metre high, internally illuminated, “parapet” sign on top of their store has attracted 15 objections so far, so that application should be decided by West Berkshire Council’s Eastern Area Planning Committee. Please sign my petition to stop the closure of Lloyds Bank in ‎Theale‬. Lloyds Bank have announced that they intend to close its branch in Theale on 8th June. This would cause hardship to local businesses and residents. It would particularly affect pensioners and those without cars as the nearest branch (in Tilehurst) is very difficult to reach using public transport. I call upon Lloyds Bank to reverse its decision to close its Theale High Street branch. 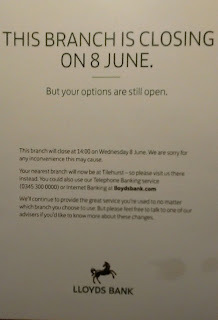 This is the only bank in Theale and closure would cause hardship for local businesses and residents. Closure would particularly affect pensioners and those without cars as the nearest branch (in Tilehurst) is very difficult to reach by public transport.